Blue crabs used as fishing bait. Blue crabs are among the most common residents of our southern estuaries. 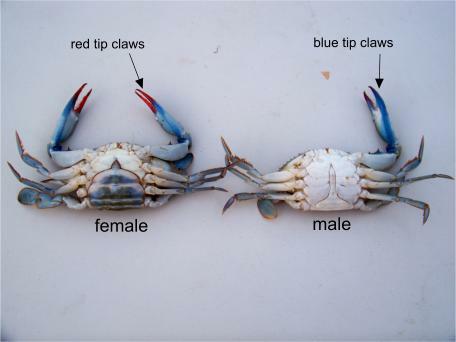 Blue crabs are bottom dwelling carnivores and scavengers which makes them a favorable target for many bottom feeding fish like catfish, red fish, and black drum. The crab is well armored with a hard outer shell and powerful claws. This allows the crab some defense against predation however crabs are invertebrates and must molt (shed) their exoskeleton (hard outer shell) to grow. Immediately after this molting crabs have a soft to paper thin shell for up to 12 hours. 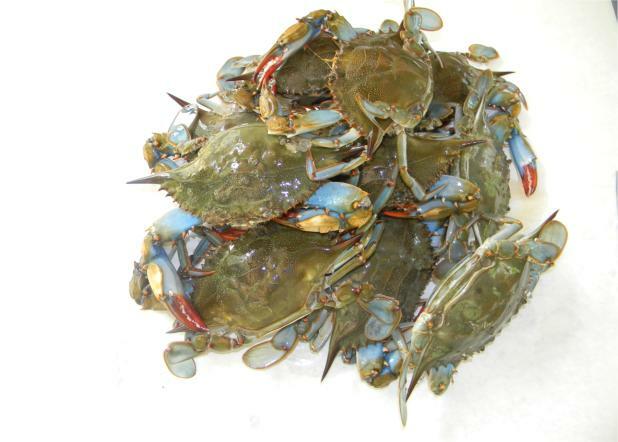 These soft shell crabs are prime meals for many species of fish and are excellent bait when they can be found. 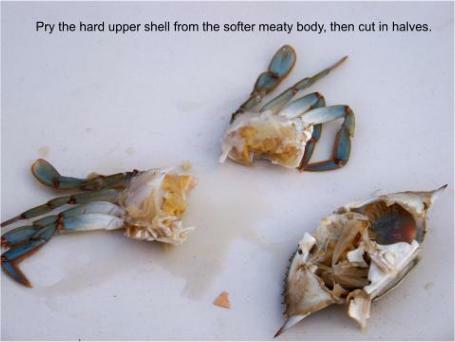 Most often however, the best method for using blue crabs for bait is to separate the hard shell from the meaty body by pulling them apart then cutting the body in half or quarters. Any style bottom fishing rig is adequate when fishing with crab. Blue crabs spent the cold months in deeper water and move into the shallows as the water temperature warms. This migration into shallow warm water along with the crab's need for food presents the opportunity to catch them. Around docks and bridges the simplest method used to catch crabs involves a hand line and a dip net. 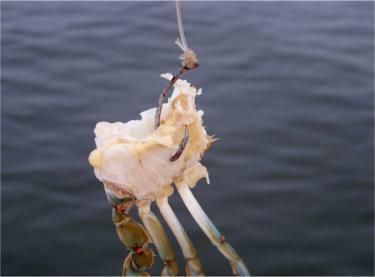 You take advantage of the crab's aggressive nature toward getting a meal by tying a weighted chicken neck to the end of a 10 to 15 foot line and drop it in the water. Allow this crab bait to sink and rest on the bottom. Upon finding its meal the crab will tug on the line, you begin slowly pulling the line in, and when the crab become visible use the dip net to scoop up the crab. Set out a dozen or so baited lines and in no time you should have all the crabs you need. Remember that the crabs are well armed and have a very painful pinch. You do not have to keep the crabs alive to use as bait therefore, immediately put the crabs in a cooler of ice this will slow put them to sleep. If you choose to go a little more high tech than simply a chicken neck at the end of a string, (any type of meat or fish should work as crab bait), there are several types of crab traps available. Pyramid folding crab trap , box traps, and ring nets work very well around docks and piers were the water is deeper. Once these traps are baited they are dropped straight down to the bottom where they open automatically luring the crab to the bait. Give these traps a good 20 minutes before checking for a catch. If you are dead set on finding a few soft shell crabs (without having to purchase them), try wading slowly in the shallows were crabs can be seen. Use a long-handled dip net and scoop them up, crabs will molt in eel grass and once molted they can not swim away quickly, this makes them easier to catch. If you do not have a dip net, try using a small cast net if the bottom is fairly clean.